The NFL’s first dynasty after Vince Lombardi’s Packers was Don Shula’s Miami Dolphins. The only dynasty we never got to see reach its conclusion on the field. After compiling a 32-2 record including two Super Bowls, RBs Larry Csonka, Jim Kiick, and WR Paul Warfield signed contracts with the rogue WFL. It brought the end to an era where Shula’s ground game and “No Name Defense” ruled the NFL. The most dominant team of 1972 & 1973 would be broken up losing two Hall of Famers in Csonka and Warfield. 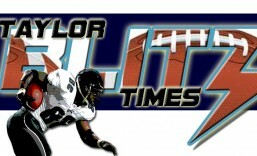 However their WFL contracts wouldn’t take effect until 1975 meaning the team would be intact for one final season. The heartbeat of the Dolphin dynasty was its ground game. In the perfect season of ’72, Larry Csonka and Mercury Morris became the first backfield tandem to each rush for 1,000 yards in the same season. They nearly repeated that feat in ’73 when Morris rushed for 954 to Csonka’s 1,003. With the team being broken up an inevitability thanks to the WFL signings, Miami had a threepeat in their sight in ’74. After an 11-3 record there was a feeling the Dolphins were vulnerable. Six of their wins were by 7 points or less. Where in ’73, all 12 wins they won by more than a touchdown. The wear and tear of upholding that championship mantle had brought them back to the pack. The game became known as “The Sea of Hands” one of the most famous games in NFL history. The Dolphin dynasty came to an end with Kiick, Warfield, and Csonka jumping to the new league the following season. No one knew Don Shula would go on to be the winningest coach in NFL history. Even more surprising, he would coach through the 1995 season and would not win another Super Bowl. 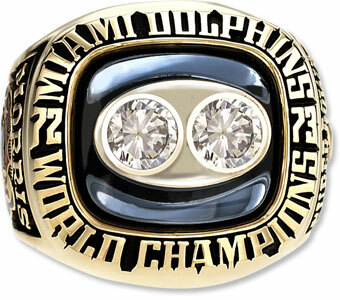 For the coach on the losing end of Super Bowl III, to the coach who drove his team to the NFL’s only undefeated season, to the man that led his team to 3 of the next 5 title games, culminating with this ring. The second NFL championship ring that crowned a dynasty. Don Shula had taken his place among the greatest coaches in NFL history. This entry was posted in Ring of Champions and tagged 1973 Miami Dolphins, Don Shula, Jim Kiick, Larry Csonka, Mercury Morris, Miami Dolphin v Oakland Raider playoff game in 1974, Miami Dolphins, NFL History, Oakland Raiders, Paul Warfield, Sea of Hands, Super Bowl, Super Bowl champion, Super Bowl Ring, Super Bowl VIII, Super Bowl VIII Ring, The No Name Defense, The Orange Bowl, The Perfect Season, Three-peat. Bookmark the permalink.